This week’s installment has lots of tips, tricks, and food-for-thought for food bloggers, authors, or anyone in this space, or thinking about entering this space. I didn’t plan it, but kept coming across great articles and posts that I think are spot on. And that made me chuckle and nod in agreement. 1. 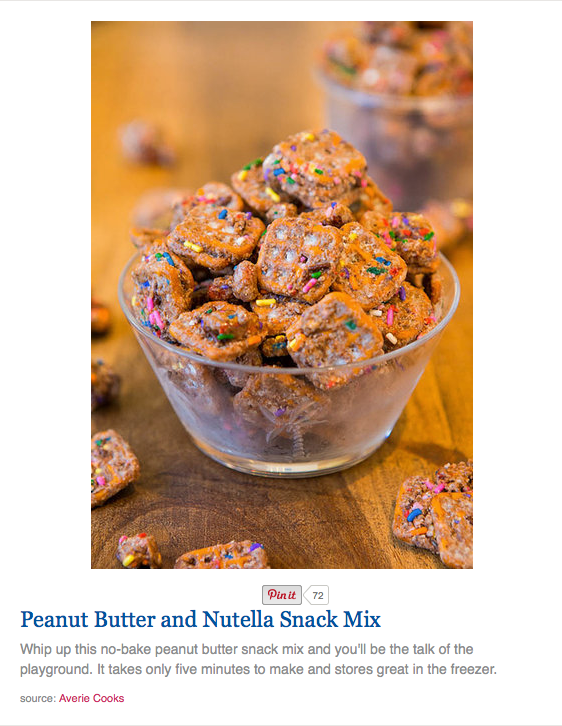 But first, Tori Spelling featured my Peanut Butter and Nutella Snack Mix on her site here. That was pretty cool! 2. 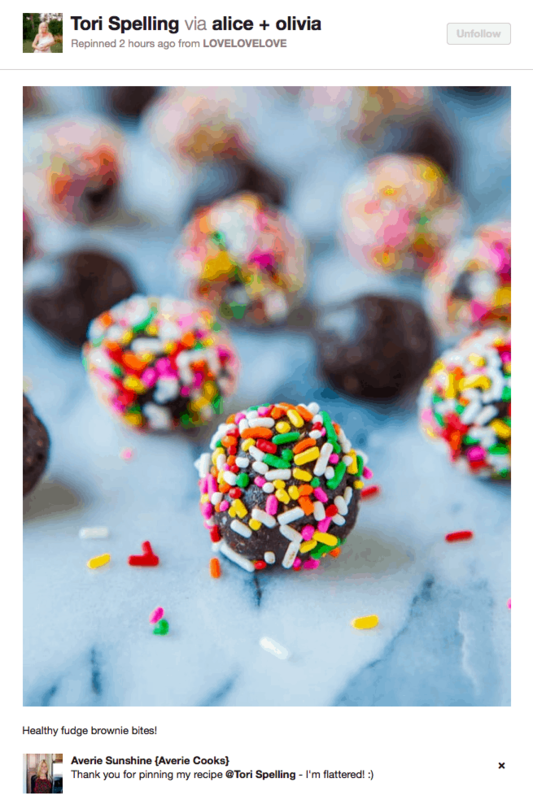 She also pinned my Healthy Fudgy Brownie Bites (no-bake, vegan, GF, grain-free/Paleo, soy-free, no added sugar or salt) the day after I posted them. I was so flattered! 4. I guess I didn’t get the message about collecting props. This is just a little of what I’ve accumulated after nearly 5 years of blogging and a shooting a couple cookbooks. We haven’t even talked wood boards, linens and fabric, stemware, silver, platters, vintage pieces, vintage bakeware, it just goes on and on. I love dishes and hunting them down, the thrill of the hunt, is so much fun. 5. Russell is at it again, hitting the nail on the head with Kitchen Loiterers, part 3 to his Day in the Life of a Food Blogger series. Honest and hilarious, and spot on. 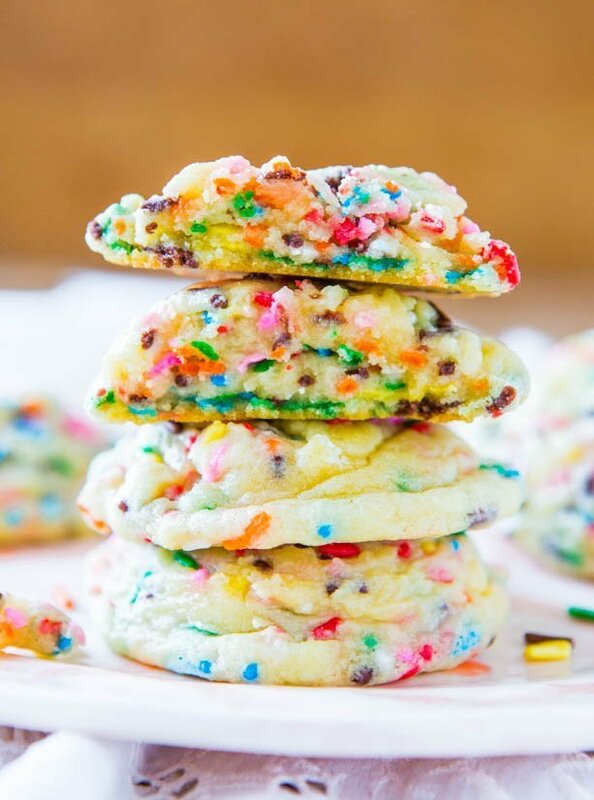 As much as I love my family, the minute I start a photo shoot, why does everyone suddenly need to be in the kitchen, open the fridge, get water, make a sandwich, or want a bite of something I just made when we have 17 dozen different flavors of cookies in the freezer that I could give them. As food bloggers, our kitchens are our offices. Glad that I’m not the only one a little protective of my office as Russell pointed out. 6. 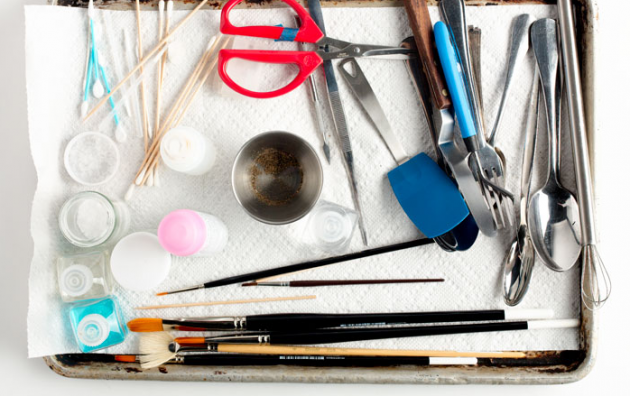 How Food Stylists Make Food Look Delicious – A look inside their toolkits from Bounty Select-A-Size paper towels to tweezers for moving an errant sesame seed. 8. Think you want to write a cookbook? Read this first. I wasf nodding in agreement to most of it. It’s not all sunshine and rainbows and fluffy Peanut Butter all the time. It’s worth it in the end, but if you’ve ever wanted to write one, just make sure you go in eyes wide open. Like parenting, you can’t possibly know what you’ve really said yes to and what’s all involved until you’re there and in the thick of it, but the author compares birthing a baby to being easier than birthing a cookbook. I concur. Here she details taking photos for the cookbook shoot. If your photography skills aren’t good enough shoot your own cookbook, the rate for 32 recipe shots was $16,000, payable by the cookbook author from their advance, to a photographer. 9. Jen’s post on 8 Things They Don’t Tell You When You Start a Food Blog – Everything from spending half your life on social media to needing to be able to understand the technical stuff, it’s all spot on. Like Jen, I thought that if you were a reasonably decent cook, and had recipes to share, that was enough. Wrong. You better become a photographer overnight as well as learn computer programing if you want to make your blog something more than just a ‘hobby’ and be taken seriously. 10. We’re in the process of moving this weekend and my life has been insane. I have been living out of boxes for a couple weeks and am so ready for it to be done. I spent Thursday carting stuff over to the new place and Friday movers came for the big stuff. We moved all of 1.5 miles away, but whether you’re going one mile or 500, it doesn’t matter. It all has to get from Point A to Point B.
I will not sleep until everything is unpacked. I hope by Monday. Or Tuesday. And I love my new place already! My posts are pre-cooked and pre-written so stay tuned for your regularly scheduled sugar fix while I unpack in the 90F heatwave. You won’t miss a beat while I sweat it out over here. If you’re a blogger, author, photographer, or wanna-be, feel free to share your tips, tricks, thoughts on anything you’ve learned along the way, things you wish you’d known, things that have really helped you, things you wish you didn’t ever come to know (like what HTML code is) or things you could do without, leave your wisdom below. If you have thought about doing any of the said things but never have, what’s stopped you? Your #5 is so true, funny. Your props cabinet looks gorge.. Thanks Ash. I need another one. Lol Mine’s packed to the max! Hey girl! Enjoying the heat wave down there? I’m ready for some 80 degree days as I’m tired of these 90 degree no air conditioning days. I’m sure it hasn’t been fun moving in this weather either. I totally feel for you girl! I love this post and I can’t wait to bring my lap top into bed tonight so I can link over and read all of these great reads. You did a great link up here on food blogging etc and I’m excited to read it all. I am so there with you about everyone chatting or getting in your way when you’re trying to photograph and stage food for a photo shoot. How about trying to photograph dinner while everyone is waiting to eat? That’s what I always encounter and for some reason, maybe it’s because my kids are growing like weeds, they were not as patient this summer. They kept commenting how hungry they were and asking me when I was going to be finished. That’s why my pics and my posts were lame this summer. I’m not one of those bloggers that makes food for a photo shoot and then wastes it. We’re literally eating everything I post. I had not only the kids home for 96 days but John was here for half the summer as well. I love having everyone around, but I’m excited to get some space and to not feel guilty every time I’m on the computer editing photos or posting. I never knew the work that went into a food blog until my blog grew a bit. In the beginning you can post a recipe and it doesn’t matter when you post your next one, because no one is really reading your blog and isn’t subscribing, but as you grow, your audience counts on you (as they should) to maintain some sort of schedule and then you have to maintain that schedule. I wish someone had told me earlier about all of the social media stuff that was involved. That’s the part that wears me out. I love the blogging and cooking part, but having to keep up with Instagram, Twitter, Facebook and comments can be more work than the actual blog. I still don’t get Twitter and I may just quit that as I’m more of an Instagram girl anyway and I feel that Instagram is way more interactive than Twitter. What is Google Plus anyway? I still don’t get that :) (you don’t have to answer, I just don’t get it). I just moved this weekend and so slammed and I read this standing in line at Target (another $250 later for stuff needed for the new place..the joys of moving…) and I was nodding in agreement to everything you said. From a family who thinks they’re going to die of starvation if they dont eat the minute you start a photo shoot or cant wait 30 mins for dinner. Have a snack? lol Another reason I am NOT a dinner blogger. The lighting, the ‘pressure’ and we eat eveyrthing I make too! I mean the desserts, sometimes we donate but if it’s a savory item, yes – that’s our dinner! No stunt food here! It all gets eaten. Excellent links and info! Would it be okay to raid your prop shelves someday? Congrats on the Tori Spelling mention!! Thanks Greg – I just need more space for them! Don’t we all, though! Although I come here for the cookies, I love seeing a little glimpse of personal stuff. Good luck with moving in this heat – I live in Orange County & I think it was just as hot up here over the weekend!! I’m ready for a hot chocolate & cardigans. I think good food photography is one of the main aspects I didn’t expect to care about so much when I started blogging. No matter how great something tastes, if it doesn’t look that great, I don’t think that many people are interested in trying it. Great post! Good luck with moving and getting settled into your new home! Great post! I love your collection. I’m just on my first year of blogging and I’ve just started to build up a collection. Totally with you on kitchen loiters. As soon as I start to take photos the whole family decide to come home and find their way into the kitchen, blocking the little sunlight I have and trying to have a bite or taste of what I’ve made. haha! 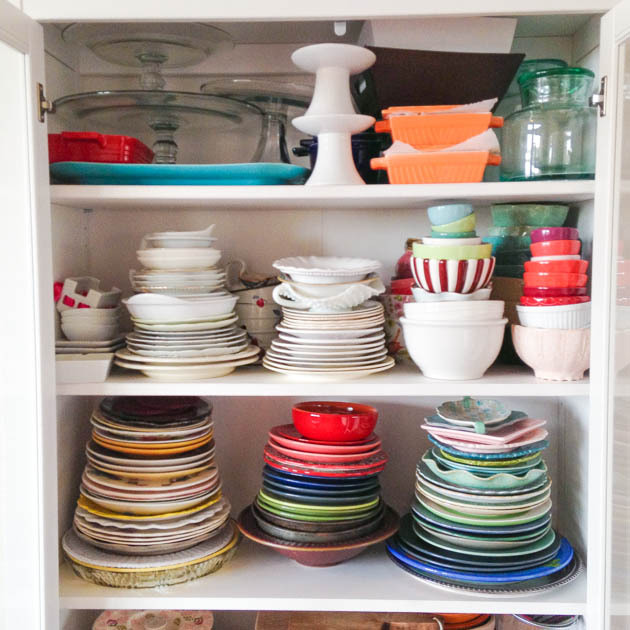 I had to laugh because I read Pinch of Yum’s post on not having a lot of props and immediately thought of all my overflowing cabinets and storage containers. Obviously I didn’t get that memo either. 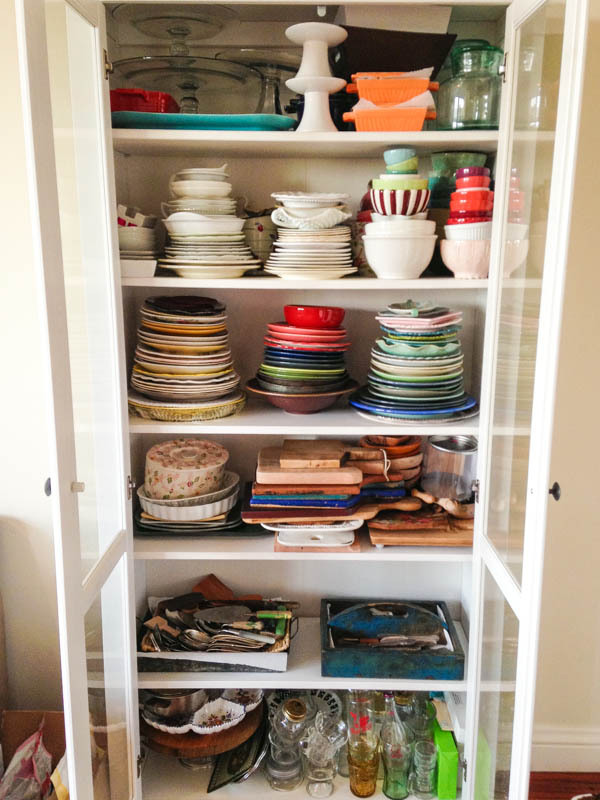 Although I have to agree with you…there is something so fun about hunting down the perfect linen or plate. I love that IKEA cabinet…I need to look at that one the next time I’m there! And I *JUST* bought another one and had it delivered and assembled today. I maxed out the first one. It’s $349 before tax, delivery, assembly etc but it’s SUCH a good value. OMG GET IT!!!! !